Unicorn Publishing Group, 9781911604211, 208pp. For over twenty-five years Tom Chambers has been telling stories through photomontages. These stunning images, blending the everyday with the fantastic, are inspired largely by travel in places as varied as American west, New England, Mexico, Italy, and Iceland. Chambers uses photomontage to present unspoken stories that illustrate fleeting moments in time and are known for being extremely evocative, eliciting feelings ranging from tranquility to turbulence—and all the points in between. Through his intentional use of magical realism, Chamber’s photomontages look believable, but improbable. Each, in fact, has been carefully constructed, using both planned images and ones that unexpectedly enhance the story he wishes to tell. Through such techniques Chambers moves beyond documentation of the present in order to fuse reality and fantasy into musings about the possibilities of the future. 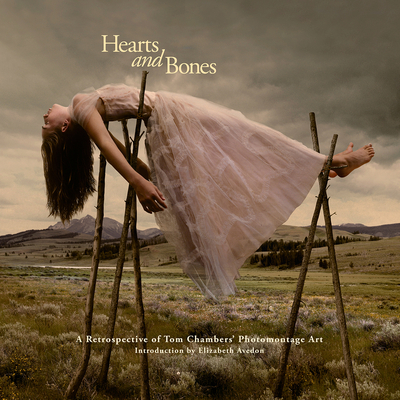 Hearts and Bones is the first comprehensive collection of Chambers's work. More than one hundred color photomontages are included in this volume, spanning his entire career. Tom Chambers was raised on a farm in the Amish country of Lancaster, Pennsylvania. Since 1998 he has devoted himself to photomontage, influenced by national and international travel, music, literature, and the art genre of magic realism. He has received fellowships from the Virginia Museum of Fine Arts and the Virginia Commission for the Arts. He lives in Richmond, Virginia. "Ethereal and surreal, Tom Chambers's photomontages 'tell unfinished stories' about childhoods in flux, gasping ecologies, and unfinished fantasies. . . . His vibrant single final frames twist storybook notions into spectral scenes--in which rowboats are moored in fallow fields, their occupants waiting for the tides to turn, or in which girls in gowns twist up in lights, read to fawns, or offer themselves up to the sky. Animal life is ever-present: communing with the young, pushing on through damaged landscapes, and--at times, it seems--waiting to take over. . . . These are images worth puzzling through, whose lovely, otherworldly suggestions promise to bleed past their edges and into your dreams."